Mickey Mantle Autograph - Real or Fake? 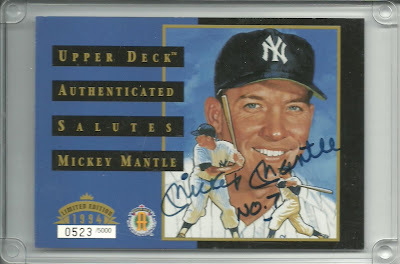 Take a look at the card above and give me your honest opinion of whether or not you think the autograph is real or fake. The card itself was produced by Upper Deck in 1994 and measures 3.5" x 5". I've had this card for over 10 years and have always wondered whether or not it's legit. Not because I don't trust where I got it from, but because of the huge number of Mantle forgeries out there. I'd like to get everyone's opinion and then I'll provide a little more information about where I got it from. Thanks! I have posted sparingly over the past several months. I haven't had the funds for any new cards recently, but I did add a few baseball related pieces to my collection. My brother and his family came to visit from Las Vegas back in July. 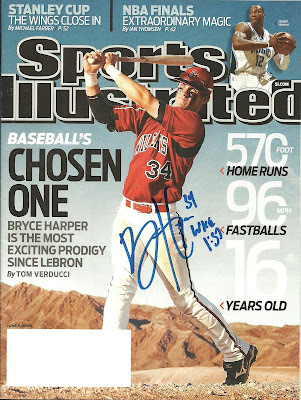 He brought this Bryce Harper autographed Sports Illustrated for me. I've mentioned before that my brother and his family know the Harper family a little bit and they go to the same church. This Sports Illustrated was donated for an auction at the church to raise money for one of the youth groups. I guess he had had it for several months but this was the first time that I had seen him in a while. I was really excited. I know a lot has been said about Bryce and I'm sure there will be plenty more said, but I still was thrilled to get this. This Ryan Roberts signed 8x10 was given to my in September by a co-worker. Her and her boyfriend had gone to a signing at a local at&t store and got to meet Roberts. This 8x10 was provided by at&t. Since they had 2 of these, they gave one to me. The photo is surprisingly nice for a store giveaway and I actually like the fact that it has the at&t logo on it because it lets you know where it's from. My family and I went to the D-Backs game on September 24th and I got this Ryan Roberts bobblehead. We got there several hours early and there was already a huge line, so we went inside for a while and let the kids play on the playground and then took off before the game even started. 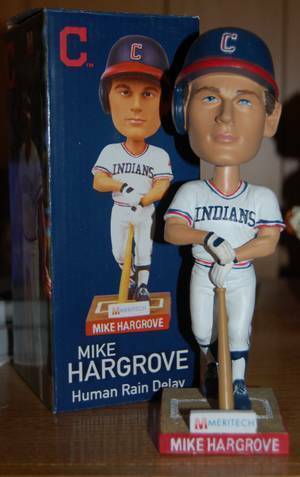 My wife is pregnant and so I knew going into it that we wouldn't be staying, but we had the tickets already and I wanted the bobblehead. It's up on my D-Backs bobblhead shelf and makes number 13. I got this Mike "Human Rain Delay" Hargrove bobblehead from a local event here in Goodyear, AZ called G.A.I.N. (Getting Arizonans Involved in Neighborhoods). The Indians and Reds always have a booth at the event because it takes place at the Goodyear Ballpark where they have Spring Training. My five year old actually won this for me by playing a beanbag toss game. I'm back. No excusses for my lack of posts recently, but I'm back. Stopped at the card shop yesterday on the way home from work and purused a big box of $2 relics and autos, finally finding one that I decided to pull the trigger on. 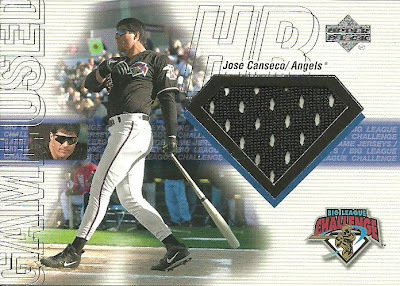 It's a 2001 Upper Deck Big League Challenge Jersey Card of Jose Canseco. I'm not a huge fan of Canseco, but I like game/event specific memorabilia, so I decided to get it.